The love of Fall around the corner comes balanced out by a dreadful equal.. Homework time. No matter how great the benefits, or how much you wish that your child's teacher would lighten the load, it's inevitable and a nightly struggle at our house. Since you most likely don't want to spend every afternoon arguing with your sweet, little angels here are a few tips to help Homework time become a breeze. 1. Before you start homework, set up a designated 'Homework Station' together. This doesn't have to be a fancy room, it could be a designated spot in the kitchen or even a small table in the playroom. 2. Shop! Head to Target, Walmart or even the Dollar Store together. Let your little one pick up supplies that will help make homework more fun-- think fun colored pens and pencils, cute erasers, pencil sharpeners, child proof scissors, stickers, the list goes on! 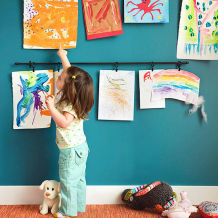 Moms, don't forget to grab something to store these items in a fun and easily accessible way. 3. To Be Signed. We grabbed a file holder for our homework station, anytime our child brings home a to be signed paper, they throw it in here and we know to review, sign and return to his/her folder. **Want some great examples of homework stations we love? Look at this mobile homework station from All My Good Things blog and check out more tips here! 4. Time to Start! Once your station is complete, we recommend setting a designated homework time. Maybe it's as soon as they get home from school or an hour after returning from school, once they've had a snack. It's up to you! We do suggest, sticking to that time everyday to create a great routine and habit. 5. Rewards. Reward your child for completing their homework and ensuring they did a great job! Create a chart and when they reach a certain level, schedule an ice cream or movie date. Them once they finish they can have 'X amount' of tech time, etc. This will teach them that good things come with hard work! 6. Show off! When they get good homework grades back from school, display them on your fridge or with this fun at home display from Parenting.com. What are some of your homework tips? We love adding to our parenting arsenal! Need help picking an after school treat? Bribe them to complete their homework with a fun visit to Little Explorers afterwards.